This conference, to be held in beautiful Palm Springs, CA, is built around several themes including new models for CTE/workforce development, a new focus on arts/media/entertainment career paths, and a new approach to students and families of trauma. This third area of focus will also address strategies for supporting migrant and undocumented students. A dozen student-led sessions will take place on Monday afternoon and keynoters and entertainment throughout the event will certainly be amazing and inspirational. NDPC/N’s Network conference is held in a different region of the country each year and is its largest and most attended conference each year. Please join us on the west coast this year for this exciting event and learn from others in the fields of high school dropout prevention, intervention, and recovery. Follow the link for registration and hotel reservations. Visit http://dropoutprevention.org/conferences/2017-national-dropout-prevention-network-conference/ for more information. Join presenters from Pueblo, Colorado, as they discuss the clinical framework behind how the human brain processes trauma, how an understanding of this framework can be leveraged by those who work with at-risk students to help those students succeed, and how one Colorado school with a high percentage of at-risk students realized success by utilizing trauma-informed education practices. The recorded webcast explores how trauma affects a student’s ability to self-regulate attention, emotions, and behavior, all prerequisites for achieving classroom competency. Presenters provide practical application strategies for assisting students to become successful in the classroom, school, and community. 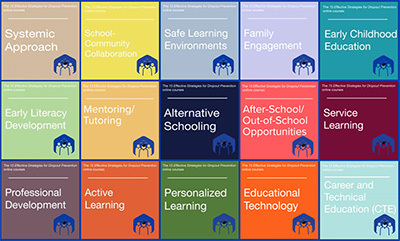 Also newly available in the NDPC/N store is a series of online course offerings on our 15 Effective Strategies for Dropout Prevention. Each course is individually priced so you can take one course or all available courses, depending on your needs, interests, and professional learning plans. Courses are self-paced and interactive, including video clips and self-assessments. All fifteen effective strategy courses are available now. Go to http://dropoutprevention.org/15-effective-strategies-online-courses/ for more information, including FAQs, or visit the NDPC/N store at www.dropoutprevention.org/shop to register for one or more of the 15 Effective Strategies for Dropout Prevention online courses. Thanks to DeeperDive Learning, Inc., (www.deeperdivelearning.com) for helping us design, develop, and offer these online professional development courses. A new Why Rural Matters report is just out from The Rural School and Community Trust. Nearly 8.9 million students attend rural schools—more than the enrollments of the New York City, Los Angeles, Chicago, and the next 75 largest school districts combined. Findings include that student achievement is in general comparable to suburban areas, college/career aspirations vary, diversity is substantial, and lack of early childhood programs is prevalent. 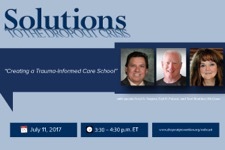 Two upcoming free webinars from The Substance Abuse and Mental Health Services Administration (SAMHSA)’s Bringing Recovery Supports to Scale Technical Assistance Center Strategy (BRSS TACS) that may be of interest: Cultivating the Next Generation of Youth and Young Adult Leaders, 7/13/17, 2:30 PM ET; and Increasing the Accessibility of Recovery Supports for People With Disabilities, 7/27/17, 2:00 PM ET. Check out the USA Mental Health First Aid courses, often offered at hospitals, universities, or mental health organizations and usually offered free of charge. Mental Health First Aid is an 8-hour course that teaches participants how to help someone who may be experiencing a mental health or substance use challenge. The training helps participants identify, understand and respond to signs of addictions and mental illnesses. There are courses geared toward adults, youth, and other populations. The National Association of State Boards of Education (NASBE) recently awarded four states with grants of $14,000 each for research and improvement in early childhood education workforce conditions. You can read more about each state’s (Iowa, Michigan, Nebraska, and New York) plans to use these grants in the NASBE’s press release here. Read “Linkages Between Early Childhood, School Success, and High School Completion,” from the Encyclopedia on Early Childhood Development, for research findings related to programs and strategies focused on early childhood education and how they relate to dropout prevention outcomes. Studies and references listed in this article are important resources on this topic. An article from Catapult Learning lays out an example of ways to facilitate active learning by “making your classroom lessons breathable”. You can read the full article here. Last month President Trump signed an Executive Order expanding apprenticeships and job training programs (fact sheet, President’s remarks, and video). Workforce development efforts are not only good for communities and economies, but can serve as an engagement strategy to increase students’ interest in school and also their understanding of the value of school. These types of efforts are not always easy in the high school setting, but in a recent blog post, the Department of Education highlighted the Academy of Construction and Design at the Integrated Design and Electronics Academy (IDEA) Public Charter School in Washington, D.C. In a visit late last month, senior U.S. Department of Education Administration officials had the opportunity to see an innovative high school apprenticeship program in action. The National Network of Business and Industry Associations recently published Work-and-Learn in Action: Successful Strategies for Employers, a book which contains information on how to connect employers and schools through work-based learning in high school. You can read the book online here.